Yesterday Jeremy (the good foreman of the company we use for a lot of work from Wisconsin) told me that he was 2 gaskets short for some of the piping that I wanted﻿ them to finish by Monday. So I checked the store room at the brewery but they didn’t have any that size. The guy in the store room mentioned to me that I could make my own, so I did that and they came out pretty well for limited tools and my first try in a hurry. 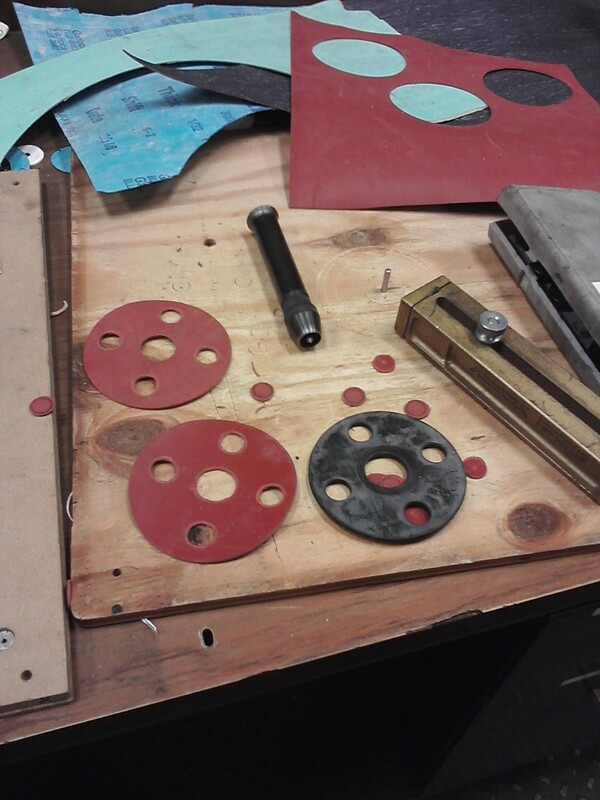 The black is one that I took out of the piping they had finished, and the two red ones were the ones I cut. I took one we had out of the piping and used it as a template (the black one). and I didn’t have a hammer, so I just pressed down as hard as I could on the thing and rotated it to make the small holes. The big one you don’t need a hammer for though, that was the easy part. cool. how did you know where to put the circles? Did you have a template? Do you have to keep hitting it with the hammer as it rotates? No, it’s just rubber. They had a thing that was basically just a razor blade that fits into a piece that you rotate around a center point, kinda like a compass (for drawing, not navigating) but instead of having a pencil at the end you have a razor blade (the golden bar looking thing, and the little peg sticking out of the plywood is what i rotated around). And the small holes they had another tool for that had a bunch of attachments for different size circle points (the black thing that looks like a flashlight) and you put that where you want it and either just press down really hard or hit it with a hammer and it makes the cut. what?! How in the world do you just make a gasket?! Is there a special saw to make the round cuts?